One of our Electronics Co-op students exclaimed “RF is VooDoo!”. Indeed, it might seem like it, but as I will outline here good antenna design and planning of an installation will allow almost anything to be accomplished including combining multiple-antennas. I am not an RF engineer, so much of what I have outlined here is by experience and trial-and-error. Checking TV Fool for available signals it was found (at the time, at least) that all desired signals were in the UHF band with the vast majority located in two directions from Niagara: North for the Toronto stations and South-East for the Buffalo stations. The Buffalo stations are also quite strong compared to the Toronto stations given both the proximity (Buffalo is much closer) and the fact that large US stations tend to operate more powerful transmitters than their Canadian counterparts. The ideal antenna for the job appeared to be a Gray-Hoverman (G-H), a design from the later 50’s / early 60’s and one resurrected by Canadian enthusiasts in the late 2000’s around the time of the digital conversion. The radiation pattern of this antenna includes a very strong gain in the forward direction (about 14 dBi) and a rather odd set of lobes near the rear of the antenna (with a front/back ratio of 8.4dB) … by carefully aligning the antenna so the high-gain forward lobe picks-up the distant Toronto stations, and the lower-gain rear lobe the stronger Buffalo stations, it would appear to ideal for this location. The GH6 antenna mounted on a pipe and extended about 1.5m above the roof line. The G-H antenna is aimed almost due North to receive the weakest Canadian signals from Toronto and surrounding area. With a high forward gain, it easily received channels 40 (OMNI-47), 41 (Global), 19 (TVO-19), 20 (CBC-5), and 44 (CITY-57). The last channel, CITY TY (Virtual 57) is often difficult to receive in the Niagara area – the ability to receive it reliably is an indication of the gain of the G-H at high and mid UHF frequencies. It is also poised well to receive the repeater channel 42 (CTV Two network) from fonthill which almost overloads the receiver. The furthest stations received reliably appear to be about 45 miles away. Buffalo is much closer to the Niagara region and so these stations are easier to receive, aside from the fact that the US stations generally operate more powerful transmitters. The G-H antenna has a relatively decent back-lobe approximately 120 degrees from the front enabling reception of these stations which includes channels 39 (CBS-4), 38 (ABC-7), and 33 (NBC-2) as well as a host of minor channels such as 14 (WUTV-29), 49 (MyTV-49), and others. Some of these channels are not carried on the cable system and are air-only including several retro channels. A radar map from TV Fool illustrating the direction of each station. Overlaid on the left, in red, is the radiation pattern for the G-H antenna and on the right, the channels actually received. There are a few more stations listed on TV fool that will not come-in but many are from Erie, PA, to the south and are network duplicates of the Buffalo stations (for example, another NBC feed, etc). As well, a few low-powered Buffalo stations are missing including channel 23 (51) which is an Ion affiliate and WBXZ (RF 15, Virtual 56) whose transmitting radiation pattern is aimed away from Niagara and is focussed on the larger Buffalo market to the east. Reception of signals in the ESE direction (i.e. Buffalo stations) is limited by the lower gain of the G-H antenna in that direction: a natural property of the antenna. A few other fringe stations are simply unwanted, or are duplicates of existing stations (for example CKVR is received on channel 42 from Fonthill but could also be found on a different repeater on channel 35 which is much weaker and in the wrong direction). So, the major networks are all covered by the single G-H except CHCH from Hamilton (an independent station but the closest to our locale) and CFTO from Toronto (more on this later). CHCH, on channel 15, is notoriously difficult to receive in this area and many people in Niagara have reported problems with this channel. In the case of the G-H antenna, the direction of this station is problematic since it lies close to a node exactly 90 degrees from the front of the antenna where gain drops to a minimum. The G-H as built also has lower gain in the low-UHF region around 480MHz where this channel lies (it works well for the big US stations which broadcast at relatively high powers but CHCH is relatively low powered). So, why not just use a rotator? Ask the TV manufacturers why most TV’s must be completely re-scanned to recognize a channel … the “single scan” feature on most TV’s makes use of a rotator impractical so it was desired to have all signals present on the feed line continually (aside from which this antenna system was designed as a “cable replacement”). Another possibility is the use of two antennae with an “A/B” switch. This is not a new idea as I recall as a child my grandparents’ house having this. On the roof were two fixed antennae, one facing Toronto and one facing Buffalo. Depending on which channel you were watching you’d flip an open knife switch on the baseboard of the back room which switched the 300Ω twinlead between the two. This is an OK solution, but it prohibits the familiar operation of “channel surfing”. The ultimate solution comes in the form of combining the signals from three (or more) antennae into a single piece of coax (called stacking), something which is usually NOT recommended! In this respect, I am creating my own CATV system (with the original definition of CATV: Community Antenna Television shared between sets and the PVR in my home). Combining antennas is usually not recommended since often times both antennas will receive the same signal but they will be out-of-phase with each other and so destructive interference will occur which will serve to obliterate the signal: if the signals were 180 degrees out of phase, and equal amplitude, the resulting signal would be ZERO! This is a variation on “multipath interference” in this case caused by two discrete signals as opposed to multiple reflections received by a single antenna which is more common. 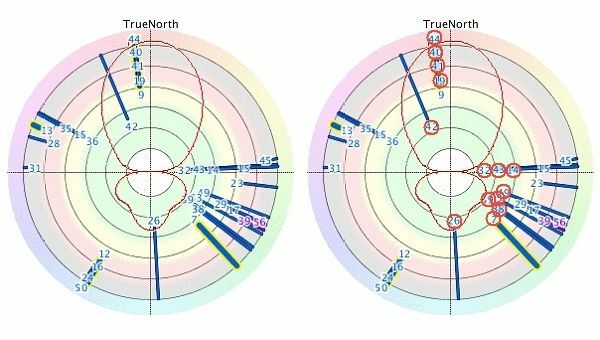 To make a multiple-antenna scheme work, then, the new antenna should be as directional as possible – it should not receive signals that the G-H already receives – and it should be specific to the 480MHz frequency of channel 15. If it does not adhere to these requirements, it may well receive the same signals as the G-H however at a different phase and so combining the signal from this antenna with the G-H will result in cancellation of signals and an overall decrease in performance. The ideal antenna, then, is a YAGI. The YAGI, often used for telecommunications, is quite directional, and has a gain which is peaked at a well-defined frequency … exactly what is required here! For optimal characteristics, the YAGI was designed with one reflector and five director elements – this results in a gain of about 9dBd in the forward direction, and a fairly narrow beam of signal acceptance of about 44 degrees. Although the forward-to-rear gain ratio is high, it proved to be not high enough to prevent strong US stations from causing problems (more on this to follow). 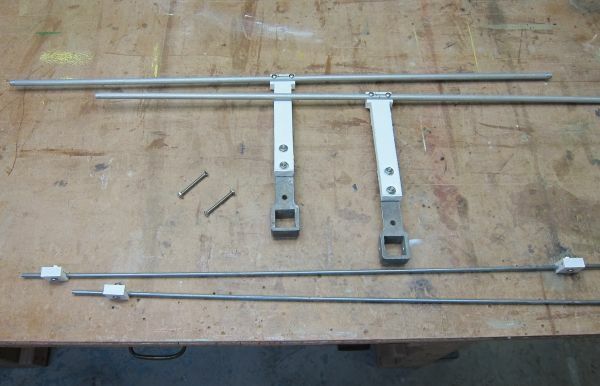 The six element YAGI designed specifically for reception of CHCH TV (RF channel 15). The box on the left side of the boom is a 10dB amplifier. The YAGI was built according to specifications determined using K7MEM’s online calculator with the actual design built seen Here. It was constructed in a similar manner to the G-H antenna with elements mounted on hard plastic machined on a drill press to securely hold elements. A detailed photo of the antenna on the workbench shows the construction technique. Through experimentation it was found to work best when placed low on the west side of my house such that the building itself shields the antenna from receiving many signals which are undesirable. It was mounted to the building using a satellite dish mount approximately 2.5m above the ground. 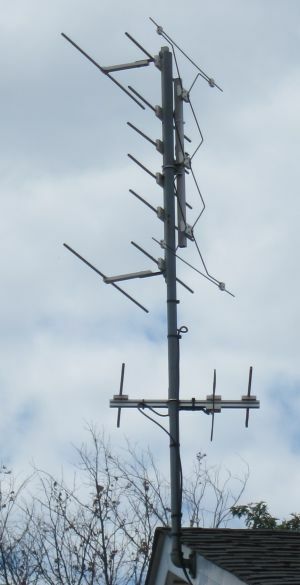 Combining the signals from this YAGI antenna with the G-H, however, still resulted in cancellation of some signals: while channel 15 was improved almost all channels from the Toronto area suffered (CITY TV on channel 44 was completely eradicated). The problem is one of directionality: the YAGI certainly has enough gain but is not directional enough to prevent reception of all signals from Toronto and even some from Buffalo. Connected alone, the YAGI was found to receive channel 15 (as desired) but also 39 and 14 from Buffalo (both very strong stations). This is a problem since adding the signals from both antennas resulted in problems on all three channels: 14, 15, and 39. In the simplest solution, it was found that the antennas could be “balanced” by feeding the G-H antenna through a 3.5dB loss before the signal is combined with that from the YAGI: by decreasing the G-H signal the relative signal on RF-15 is much stronger and so any cancellation is minimal. Similarly, the signal from RF-14 and RF-39 are stronger from the G-H. This was an “OK” solution however the G-H signal was cut by 3.5dB which is undesirable and still destructive interference from the two antennae occurs. Usually, the signal from one antenna was large enough to swamp the other and ensure a decent signal is left for reception (i.e. complete cancellation of the desired signal is not possible) however occasionally problems were seen where a channel is seen to fade from a strong signal to a weak one, and back again, likely due to the strength of the signal on the YAGI varying due to reflections and such. Clearly, a better solution was required. Issue Number 1, receiving channel RF-15. With the G-H disconnected, and the YAGI used alone, this signal is clear however the G-H seems to receive enough signal so that when combined with the YAGI it eliminates the picture altogether. The solution to this specific issue was to add a narrow-band notch filter to the G-H antenna such that the channel 15 signal from the G-H is eliminated completely … reception on that frequency occurs, then, only from the YAGI antenna. Several designs of filters were attempted including a coax quarter-wave stub (not easily tunable and not narrow enough – but it was employed later) and an L-C shunt (where an inductor and capacitor in series shunt the undesirable signal to ground). The later worked but was found to cause attenuation of lower frequencies and so it was not a true “notch” filter but rather more like a notch and a high-pass combined resulting in the attenuation of desirable signals below RF-15 (including WBBZ from Buffalo on the high-VHF band at channel 7 which was, surprisingly, completely blocked by the filter). Finally, a parallel notch filter was built in which the inductor and trimmer capacitor are in parallel and then placed in series with the signal. This design ends-up being an almost perfect notch filter with a very low loss at frequencies other than the notch frequency. The 480MHz notch filter designed to eliminate the signal from the G-H antenna (version 1). The notch filter consists of an inductor wound of two turns of 14 gauge copper wire around the shaft of a 5/32″ drill bit and spaced by one wire spacing between windings (wind two pieces of 14 gauge wire in parallel around the drill bit then remove one). The resulting inductor has a value of about 30nH. The trimmer capacitor was measured to have a capacitance which varies from a few pF when completely open to 100pF when tightened. In typical RF fashion, it was soldered directly onto the terminals of the RG bulkhead connectors. Everything is mounted in a metal box for shielding. The advantage of a series resonant filter like this over any other design is immunity from load impedance changes: the resonant freqeuency of the L/C circuit is independent of the load (although the Q of the circuit will change). Details on winding coils can be found here on G4SWX’s page on filters. In operation, the notch filter was placed on the incoming G-H feed line and is easy enough to tune with the range spanning well into the upper-UHF band – when the trimmer capacitor was opened to only a few pF of value channel 44 was completely inhibited. Closing the capacitor (hence increasing the capacitance) lowers the resonant frequency of the filter which can be seen by flipping-through progressively lower RF channels and watching the signal drop to zero (or almost zero) when the right frequency is reached. When properly tuned, the signal from CHCH on RF channel 15 (combined from the YAGI) was increased significantly (“two bars”) but some degredation of adjacent signals is also seen (channel 14, WUTV, was seen to drop “two bars”). This is somewhat unavoidable since the filter does have a finite notch width and normally it would not be a huge issue as adjacent signals (including 14, and 20) are quite powerful. Tuning is, however, quite critical and requires that you flip between adjacent channels to determine the exact center frequency to know when the filter is tuned to the desired frequency (480MHz, in this case). Still, occasional instability on channel 14 occurred (made worse since the notch filter reduced the available signal on that channel) and besides, during a storm one might well wish for that extra signal on adjacent channels and so a higher Q filter (which can notch only 15 without affecting 14 only 6MHz away) is desired – easier said than done! One improvement was to use flat windings: the 14 gauge wire was literally hammered to a flat wire approximately 3mm in width then a coil wound of that. This is a left-over idea from my days of experimenting with Tesla coils, the primary of many of which are wound with flat copper windings. The flat coil in the same filter circuit does indeed yield a higher Q filter which is evident by the much higher signal available on adjacent channels 14 and 19 – almost no degredation of those signals appears. In addition to the inductor, the trimmer chosen was a ceramic type which also has a high Q. A very high-Q notch filter for 480MHz employing a flat-wound coil. The range of the trimmer capacitor (3 to 10pF) required a series 7pF capacitor. The entire filter was built into a metal tin originally holding mint candies. One warning: with the high-Q inductor comes very, very CRITICAL tuning – turning the trimmer capacitor only a degree makes a very notable difference in the signal. It is easiest to tune the notch filter using an adjacent, receivable channel (channel 14 in my case) then simply “tweak” the capacitor so the peak frequency moves slightly to the desired channel. I cannot stress how critical this operation is – patience is required here since it is all too easy to simply miss a resonance point while tuning through the range. f = 1 / ( 2π√LC) where f is the frequency in Hz, L the inductance in Henries, and C the capacitance in Farads. Issue Number 2, channel 39 stability. use of a single notch filter on the G-H feed as described above, tuned to eliminate RF channel 15, serves well to improve that channel however instability was noted on channel 4-1 (RF 39). Occasionally, on this channel, the signal strength meter was seen to jump from five bars down to one then back again (with an accompanying breakup of the picture) and the cycle continues. With the YAGI disconnected, the problem disappears completely (first hint), but more importantly both channels are received with the YAGI alone! Despite the fact the antenna is facing the wrong direction for channel 4 from Buffalo it still receives this channel! I should have realized that the direction of the YAGI towards Hamilton is almost exactly 180 degrees from the channel 4 (RF 39) transmitter. The YAGI _should_ have been designed with a better reflector to prevent this signal from being received in the first place … an oversight in planning! In an attempt to solve this problem several approaches were tried but ultimately a notch filter is required on the YAGI feed to eliminate undesired signals (especially channel 39, but other signals from Buffalo in the 30’s and a few Toronto signals in the 40’s). The first approach was to use a simple L/C notch filter, as described above, installed on the YAGI feed to eliminate RF-39 from the YAGI feed however this did not completely fix the problem, nor did it address the channel 14 problem (described a bit later) which is too close to channel 15 for comfort. In the case of this second notch filter on the YAGI feed, a high Q is not desired and so a cheap plastic trimmer was used as well as normal, round, 14-gauge bare wire for the inductor. When tuned for channel 39, the filter eliminates surrounding channels (which are weak regardless) spanning from channel 32 to 47. Surprisingly, the notch filter built in this manner was insufficient to completely eliminate the strong signal received on channel 39 and so occasional instability was still seen (bummer). A deeper notch filter would ultimately be required. Alternative approaches were attempted including filtering the YAGI to ensure only a single frequency is received. A simple bandpass filter was built using another parallel trimmer capacitor and inductor whereby unwanted signals are shunted to ground. This works, but attenuates the desired signal as well (in a similar manner to the shunt notch filter for the G-H which acted as a high-pass filter) and so a better approach is a series L/C circuit since it is not sensitive to load impedance. A number of variations were tried. In the final version, the trimmer capacitor used (a ceramic unit) was measured to have a minimum capacitance of 6pF (and a maximum of about 60pF) which is not low enough to allow the filter to be tuned to 480MHz so the trimmer capacitor was wired in series with a 2pF ceramic disc capacitor (actually, two 1pF caps in parallel) which was then soldered in series with a two-turn inductor. When properly tuned, the circuit has a low impedance only at the resonant frequency and so that signal is passed. The filter was found, with the values given, to be tunable between channels 14 and 25 and was narrow enough to allow channel 15 to pass but effectively block channels 19 and 20. Unfortunately this series circuit, too, did pass a substantial signal at channel 39 (despite the fact it is well outside the passband – which gives an indication of just how much signal the YAGI is receiving on channel 39 and why it is such a problem) so the YAGI signal was passed through the channel 15 bandpass filter (a series L/C bandpass filter) then a notch filter (similar to the channel 15 notch filter already described) tuned to channel 39. The notch filter effectively filters out not only channel 39 but all surrounding channels in the 30’s and 40’s such that if a strong reflection is received by the YAGI it will not affect the received signal. A coax stub filter for 620MHz (channel 39). Built from RG-59 cable, the incoming and outgoing cables, on the left, are tapped and an open length of coax attached. Length of the stub is critical. Tuning is critical and is completed simply by snipping the stub shorted (the end of which is unconnected). The stub was initially 15cm in length and the TV tuned for RF channel 14. The stub was then snipped shorter 3mm at a time. At a length of about 12cm, that channel 14 signal was seen to disappear. The TV was then set to a higher channel and the stub shortened 3mm at a time until that channel disappeared (the lower channel then reappeared). The process was continued, tuning the TV to progressively higher channels and snipping a few millimeters of cable at a time until channel 39 disappeared. The resulting stub is about 9cm in length (in theory, it should be 8.0cm, so be sure to tune it experimentally). As an added bonus, the notch isn’t terribly narrow so channels in the 30’s and 40’s (many of which were very weak from this antenna to start with), are severely decreased. Could it be THAT simple …. Yes! 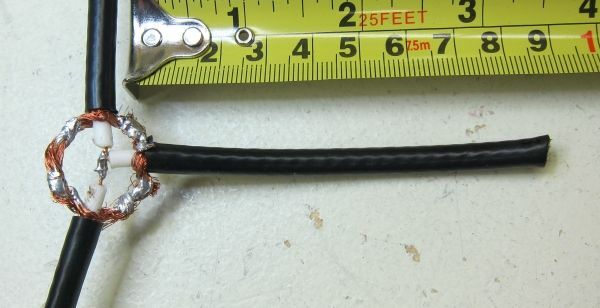 The coax stub filter described was built from RG-59 cable by soldering a “tee” of three cables: an input and output cable (each with a screw-on F-59 connector) and an open stub of cable. The cable was initially cut at a length of 15cm and tuned by progressively shortening it. In theory, the length of the cable should be a quarter wavelength times a velocity factor (the speed of the signal inside the cable – analogous to the index of refraction of light). For a 620MHz notch filter, the wavelength is c/f (where c is the speed of light and f the frequency in Hertz) or 0.484m so a quarter wavelength is 0.121m. Now, multiply this by a velocity factor of 0.66 (specific to RG-59) and you have a predicted stub length of 8.0cm. It was found that velocity factor is not an exact thing though, and foam core cable (the kind I used) has a velocity factor of 0.8 so the predicted length is then 9.7cm. The best way to tune the filter, then, is experimentally. The cutting was stopped at 9.3cm and logically is within a few mm of the optimal value for channel 39. Note that when tuned for channel 39 channel 32 is reduced to 33% of the original signal strength. This should give an estimate of the width of the notch (the -3dB points are usually specified as approximately +/- 10% of the center frequency which would be about what was observed). It was found to reduce the signal level of all channels between 32 and 44 to an unusable level (i.e. far, far below that available from the G-H). Note, also, that the quarter-wave stub filter described here is a notch filter but this can be converted into a bandpass filter simply by shorting the open end of the coaxial stub. It will still have a relatively wide bandwidth though. 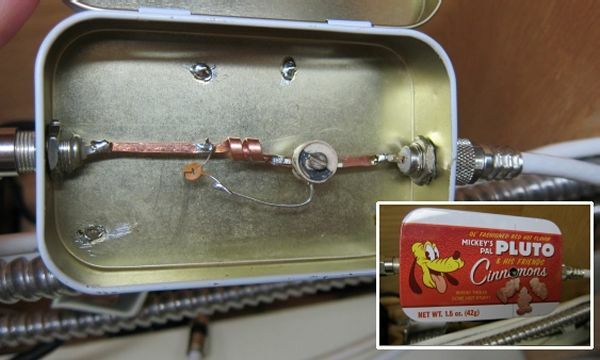 If the desired channel was close to the channel to be notched, a narrow-band high-Q notch filter such as that built for the G-H feed could have been used however in this case, the coax notch filter with it’s single deep notch, and relatively wide “wings” serves extremely well! It is the simplest and cheapest filter of all however tuning is critical and if you cut too much off, you replace the stub and start again. So, if the YAGI antenna is facing the entirely wrong way, why does it receive anything significant at other channels? The answer lies in the relative signal strengths. Consider the desired channel RF15. According to TV Fool, the signal power at the reception site is -62.6dBm. The YAGI is aimed directly at this station and so, coupled with the expected antenna gain of 9.8dB the received signal should have a power of -52.8dBm … small but entirely usable (and add another 10dB to that from the mast-mounted antenna). Now, consider RF39 which is the problem here. This strong signal has a received power of -39.2dBm at the reception site. The antenna is entirely non-optimal at this direction and will exhibit an estimated gain of only 2dB (at most) so that the received signal will have a power of -37dBm. Unfortunately, the desired signal at RF15 is still 16dB (or forty times) less than the undesired signal at RF39. Clearly a decent filter (i.e. with a large attenuation at RF39) is required to eliminate this component which will certainly interfere with the signal at RF39 received via the G-H.
OK, so we can now determine how good the filter must be. Let’s assume we want to attenuate the RF39 signal (at 620MHz) -16dB but not affect the signal at RF15 (476MHz). This requires a filter with a roll-off of -16dB in the interval from 620MHz to 476MHz (which is 0.3 octaves) or 48dB/octave. This is an incredibly sharp filter and, if built with inductors and capacitors would feature eight elements … and at that the filter is still likely barely adequate since the signal is still quite strong (i.e. we’d like to get that signal at RF39 down at least another 10dB so it does not interfere with the signal from the G-H antenna. That would result in a roll-off of 87dB/octave which is essentially unheard-of in a ‘regular’ L-C filter. Post-Script: Early in 2018 WIVB changed frequency from RF39 to RF32 sharing a transmitter with their sister station WNLO. Located on Grand Island, NY, the new frequency and transmitter (at 1 MegaWatt) automatically solved many reception issues and so the above issue no longer exists. Issue Number 3, channel 14 stability. This one was thought to have solved itself when the G-H notch filter was upgraded to a very high Q filter using flat wire. While the YAGI receives channel 14, which cannot be effectively filtered-out from that feed due to it’s proximity to the desired channel 15 (6MHz away), the signal from the G-H is many, many times more powerful so when combined, partial cancellation occurs but the G-H signal “wins” and a stable picture appears. An earlier problem was noted on channel 14 due to the large signal from the YAGI which was on the same order of magnitude as the signal from the G-H once it was decreased by the old channel 15 notch filter which had a relatively low Q (as evident from the fact that when tuned to channel 15, the signal on channels 14 and 19 were both seen to decrease). Attempts to fix the problem by skewing the filter to a higher frequency, leaving a larger signal at channel 14, were successful however made tuning of the filters – already a “touchy” operation – more difficult. The new G-H notch filter, with an incredibly high Q, drastically improved the signal available on channel 14 which completely “swamps” the signal received from the G-H. It was thought that the problem was solved earlier however the addition of the channel 9 VHF antenna (below) caused the problem to reappear (or it might have been coincidence that the problem appeared at the same time): the problem manifests itself as an unstable signal (bouncing between zero and four bars) which leads to signal breakup. The solution to this problem was simply another notch filter on the YAGI feed tuned critically to lower the signal on channel 14 but leave channel 15 almost unaffected. To do this, yet another L/C notch filter was built and inserted in series with the coax stub filter. This time, the notch filter was tuned to _below_ channel 14 so that channel 14 takes a “bigger hit” than channel 15. Ultimately, the signal on channel 14 was reduced to a level where it is always smaller than the signal from the G-H and so complete cancellation cannot occur. The next step was channel 9 (CTV). Channel 9, CFTO from Toronto, still operates on VHF where the G-H does not work. During the early days of the digital conversion this station was to be assigned an UHF channel but now their digital channel occupies the same frequency as their old analog channel did. Unfortunately, that means the G-H design is unsuitable for this channel. Two approaches were possible here: either adding NAROD resonators to the G-H design to expand it’s frequency range to the high-VHF range (which can, apparently, boost gain in the high-VHF range by 9dB likely allowing reception of this signal) or addition of a third antenna designed specifically for this station. 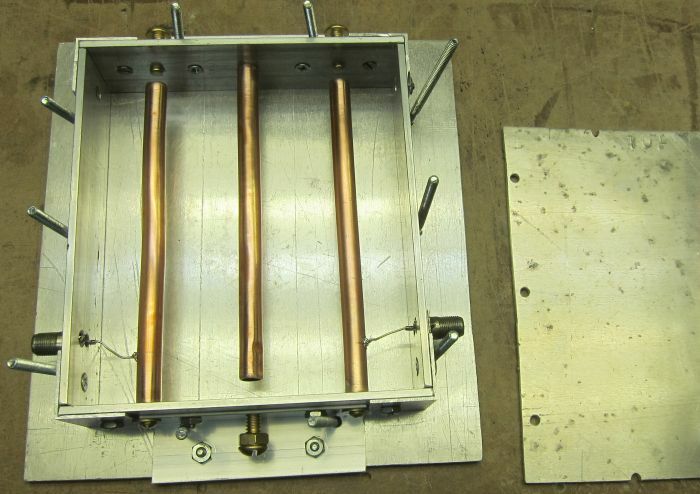 The addition of NARODs is detailed on Nikolai Mladenov’s site where he details the modifications for a GH6 gen1 antenna to include two “top hat” type NARODs and two or three reflectors which served to expand the frequency range of the antenna to the VHF-Hi band making it a general purpose wideband DTV antenna. The two straight NAROD elements(76.8cm in length), with clamps allowing these to be mounted parallel to the top and bottom G-H elements, and the two VHF reflectors (82.8cm in length and lying 200mm behind the normal G-H reflectors). All are constructed for retrofit of the existing G-H antenna (for example, the reflectors are mounted on clamps for the square boom). Unfortunately, the addition of the NAROD and reflector elements did not allow reception of channel 9. An amplifier was added at the end of the feed in a feeble attempt to receive the weak signal but “you can’t amplify what isn’t there” – this is true with any antenna design and certainly justifies the use of mast-mounted amplifiers. So, that meant the YAGI route. As a preliminary experiment, a simple closed-loop dipole (783mm on the long side) was popped-up on a piece of wood 2.5m above the ground in my front yard. It received channel 9 very well with a signal level of “60%”. Unfortunately, the same dipole receives RF channel 7 as well as a host of strong Buffalo and Toronto UHF channels! Obviously filtering will be required to make this VHF antenna work with the system. In an attempt to make the antenna more selective, a single reflector and a single director was added (all tuned to channel 9 at 186MHz). The additional elements (a) improved gain since the signal increased to “75%” when in the exact same position as before and (b) did indeed make the antenna more directional decreasing the signal level on strong the Buffalo channels. A three-element YAGI was built for 186MHz (again, using K7MEM’s design) with the entire boom only 20 inches in length. A balun was used but not an antenna amplifier since the signal from the prototype antenna was quite strong – the gain of the antenna (6.5 dBd) was more than enough. The antenna was mounted about a foot below the G-H on the same mast and downfeed was made using RG-59 (which has low loss for the low frequency used but a higher loss at UHF frequencies which is desirable here … this line was used solely for convenience since it was there from an antenna used in the late 90’s). Filtering is absolutely required and so a VHF low-pass filter was built. This seven-element L/C filter completely eliminates any UHF channels received (It exhibits a loss of -40dB at 470MHz where the UHF band begins). The filter was built on the blank (insulated) side of a piece of single-sided printed circuit board – the copper is used as ground and several pieces of self-adhesive copper foil tape are used as terminals. Construction using this technique assures a large ground-plane and a solid continuous ground for the three capacitors. The 200MHz low-pass filter designed to eliminate UHF signals from the second YAGI feed. The low-pass filter as built on single-sided printed circuit board. The inductors for this particular filter were wound on a 1/4-inch drill bit using 16 gauge wire and spaced by one wire winding. The circuit was modeled, roughly, after a design from W6PQL (originally a 432MHz low-pass filter for amateur radio usage) and you might find this filter designer or this filter designer useful in designing your own (coupled with the earlier reference for winding your own coils). Technically, it is a seventh order Butterworth filter with a cutoff of -40dB at twice the design frequency. Designed for 200MHz, this low-pass filter will show a loss of over -50dB in the UHF band – precisely what is required. Post-filter, the channel 9 signal was found to be low compared to other channels on the system and so an inexpensive distribution amplifier was used to boost the signal before injection into the system via a splitter (it was combined with the G-H signal first which is then combined with the channel 11 YAGI signal). 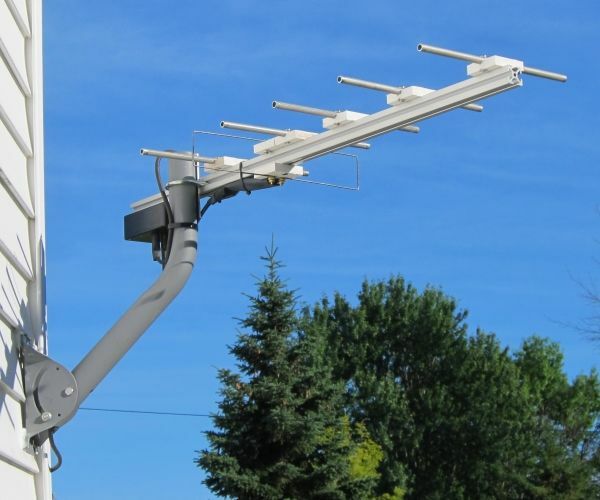 The two antenna system has become a three antenna system with the G-H antenna receiving the majority of signals and each YAGI designed specifically for one or two channels each. One might expect issues with channel 7 (virtual 67) which is received by both antennas (the small YAGI and the G-H) however the G-H signal is far larger (since the YAGI is aimed ninety-degrees from Buffalo) and so no significant decrease in signal was seen … until six months later! For six months no real interference was seen on RF channel 7 between the signals from the two antennas then, one day in the spring of 2015, channel 7 (virtual 67) was unstable. It might have had something to do with a major geomagnetic disturbance at the time but regardless of the source, channel 67 was gone! The only solution was to add a notch filter to the VHF YAGI to remove the signal from that feed. A simple LC series notch filter was built but the proximity of the unwanted channel 7 (174 to 180 MHz) signal was too close to the desired channel 9 (186 to 192 MHz) signal to filter-out. A coax stub filter would be a poor choice here since it is not particularly narrow so a high-Q series LC filter was built using two flat turns and a 12-65pF variable trimmer capacitor. As expected, tuning was critical, and was accomplished by first tuning the filter to eliminate channel 9 then slowly tuning to optimize RF channel 7 (which was seen to rise in strength). Now, channel 7 is unaffected by the presence of the VHF YAGI at all (disconnecting it does not change signal strength), and the channel 9 signal is unaffected by the presence of the filter. The combination of the narrow notch filter and the VHF-band low-pass filter in series effectively makes a bandpass filter for channel 9 only. The system, as described so far, worked well for almost a year however it was noted that occasionally pixelation would occur and invariably it was due to atmospheric phenomenon … it happened only on certain days when the conditions were just right (or wrong ?). Apparently, under these conditions the YAGI on the back of the house would receive signals that were normally reserved for the Gray-Hoverman and destructive interference would occur: the first hint was the signal meter swinging wildly from four bars to zero and back again. This never occured on RF channel 39, since it was trapped from the YAGI feed, however a few nearby channels would exhibit this behaviour occasionally since the coax notch filter has a relatively narrow bandwidth. The solution is, then, a better filter. Experimentation (by noting signal levels with both the G-H and the YAGI connected then just the G-H alone) showed slight interference in the VHF (on RF channels 7 and 9) as well as several UHF channels away from the coax trap. An educated guess was that a 5dB reduction in the VHF and a 7dB in the UHF at the affected channels would work well to reduce this. In the VHF, then, a first order high-pass filter consisting only of a series capacitor will work. This filter has a slope of 6dB/octave so if designed for 500MHz it will exhibit a loss of -6dB at 250MHz and -12dB at 125MHz (although a small loss will still occur at the design frequency of 500MHz). In the UHF a considerably sharper filter is required since channels are very close. A five element Chebyshev filter was chosen with the capacitor values chosen purely by experimentation (with a variety of capacitor values soldered in and tested). Two 4.7pF capacitors in series gives the required 2.4pF where the filter was found to pass RF-15 without much degredation but eliminate interference with high UHF channels (i.e. connecting the YAGI to the system through the filter shows no major decrease in other signals). In theory, it is has a cutoff frequency around 500MHz allowing RF-15 to pass but substantially attenuating signals at frequencies above that. Even the powerful RF-43 (channel 17) signal was attenuated to levels where it was not received. The completed filter circuit is shown below. 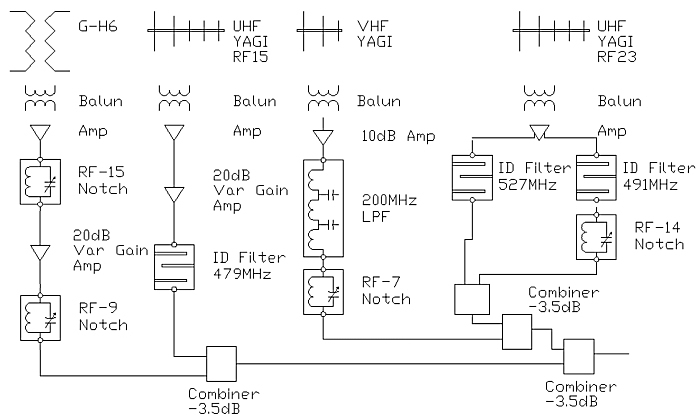 he bandpass filter for the RF-15 YAGI consisting of five-element low-pass and first-order highpass elements in series. This filter could replace the coax stub however the stub filter was left in place to ensure an extremely deep notch at RF-39 so no interference occurs whatsoever. As well, the RF-14 notch filter is still required since this frequency is far too close to the desired RF-15 to filter-out by any other means (these adjacent channels are only 6MHz apart). Ultimately, a new filter was needed which has an incredibly sharp roll-off to eliminate interference between signals from the two antennas. As well, it is desired that is could discriminate between adjacent channels which are only 6MHz apart, specifically RF14 and RF15. The only practical possibility is a resonant filter with an extremely sharp resonance. To test this, a cavity filter was built into a metal tank – this is one of the few filters that usually exhibit an incredibly sharp slope as required here. A quick prototype filter of that type was built and it did function although the cutoff is not high enough to completely exclude several signals which are close – the cavity filter removed some channels in the 30’s and 40’s however strong channels still get through meaning interference will occur. Components for the interdigital filter including rods and frame pieces. Rods are built from 1/4″ copper tubing with a 10-24 threaded rod insert and the frame consists of pieces of 1.5″ by 1/8″ aluminum strip (which happened to be available and make an excellent spacer to keep the box completely consistent). Tuning screws are 1/4-20 brass bolts. Assembled filter components. The top and bottom are simply 1/8″ aluminum plates clamped around the frame. 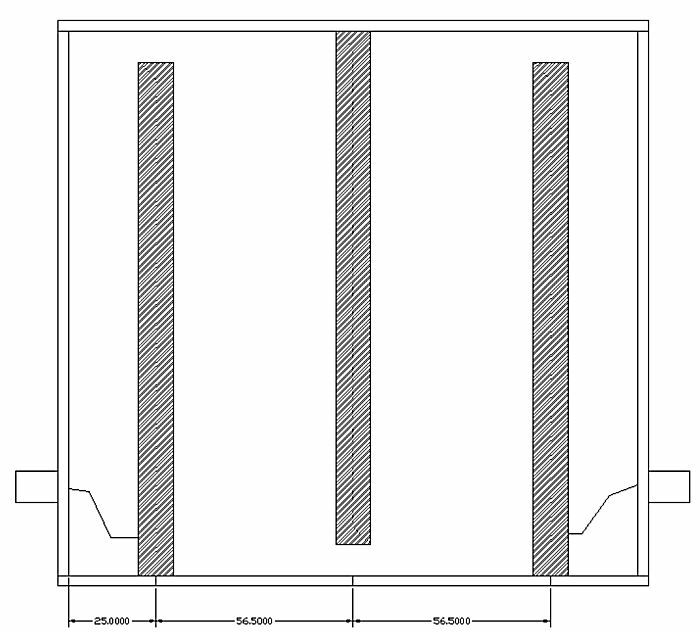 Design parameters were 479MHz center frequency, 1.5″ deep box, 0.25″ rod diameter, 75 ohm impedance. This quick prototype (‘quick’, but it still takes hours to build since dimensions are very critical) was built for RF-15 and works! Tuned to RF15, it completely excludes strong nearby signals – for example, careful tuning allows elimination of channel 14 completely! One problem though is a large observed attenuation loss – a 10dB amplifier was required after the filter to bring the signal back to a usable level but even this is problematic since noise from the chain of amplifiers and filters results in a barely usable signal. Losses of the filter, as well as the lower bandwidth than expected, led to the construction of yet another filter, this time with much better precision than the prototype. The new filter was designed for a center frequency of 479MHz and a bandwidth of 10MHz (allowing it to be tuned to the 6MHz channel). It was constructed using 1.5″ one-eighth of an inch thick aluminum plates as spacers (the ends and sides). End and side plates were cut square using a mitre saw with a carbide blade (it was felt the bandsaw cut would not be square enough) and are held together at each corner using pieces of 1/16″ thick 1″ by 1″ aluminum corner extrusion (both the corner extrusion and the 1.5″ aluminum sides were chosen based on availability). To assemble the frame (ends and sides) the pieces were placed on a flat plate of metal and the corner extrusions held in place using clamps – the entire clamped assembly was then placed into the drill press and drilled such that holes go right through the corner brace and 1/8″ aluminum plate. Each was then labelled before disassembly to ensure to went back together perfectly square and perfectly aligned (i.e. the sides and end plates were at exactly the same height and corners were perfectly aligned). Machine screws (6-32) were used for construction to enhance grounding of the pieces as well as mechanical stability and all screws had flat heads which were recessed into the aluminum by drilling a taper for each screw when disassembled (the screws protrude outward to avoid having them add capacitance in side the cavity – this was also the reason flat-headed screws were used). Rods were made from 3/8″ OD soft copper tubing (increased from the original diameter used with the prototype) and pieces were cut longer than required then a 6-32 brass nut was press-fit and soldered into one end. After cutting the copper tube to the exact size required, small brass screws hold the completed rods to the outside plates. Opposite each rod a 1/4-20 brass bolt acts as the other terminal of an air-gap capacitor. Like the prototype, the four-sided shell is clamped on the top and bottom between two plates of 1/8″ thick aluminum using a number of bolts around the periphery. The frame was well constructed and was already found to be square so clamps on the outer plates (as shown on the photograph that follows) were found to be unnecessary. The entire filter can be constructed using a drill press and metal saw (something that cuts perfectly square) and takes about three hours to construct given the precision required (i.e. measure everything twice) … you cannot ‘slap’ this one together! A few dimensions were changed from the prototype as well. The spacing of the side-plate to the center of the outer rod element was increased to 25mm. The resulting design has inner dimensions of 156.5mm high and 163mm in width. Since the top and bottom plates are longer to overlap the sides and ensure complete connection, those two plates were cut 1/8″ longer on both sides (about 3mm) for a total size of 168mm each. The centers of the rods are then (as measured from one end) 28mm, 84mm, and 140mm (where the rods are spaced 56mm apart). The input and output taps on the outer rods are 11mm from the grounded ends and the outer rods are 147.3mm in length while the inner rod is 147mm. The rods were cut more precisely than the other components (which have a tolerance of 0.5mm) by sanding the ends with emery cloth until the desired length was reached. With the lengths this accurate, the filter was almost tuned to the exact frequency required with little adjustment required. The basic top-down view of the filter elements. The sides of the filter are cut to exactly 156.5mm and the top and bottom plates overlap by the thickness of the material on each side (1/8″). “F” connectors are mounted on each side and connect to the outer rod elements as shown (with the tap 11mm above the grounded end). Not shown are the tuning screws (seen in a photograph below). A better filter, constructed solidly and with decent precision (all measurements were within 0.5mm), this one performed VERY well. Observing a signal-strength meter with and without the interdigital filter shows that is decreases the nearby RF14 signal to unusable levels (likely attenuating it about 6dB) and completely eliminates all other signals over two channels (12 MHz) away. In fact, the filter design predicts a loss of over 30dB for signals only three channels away! It is, for this application, the perfect filter the only downside being the critical construction required to make it work properly. The final version of the interdigital filter. 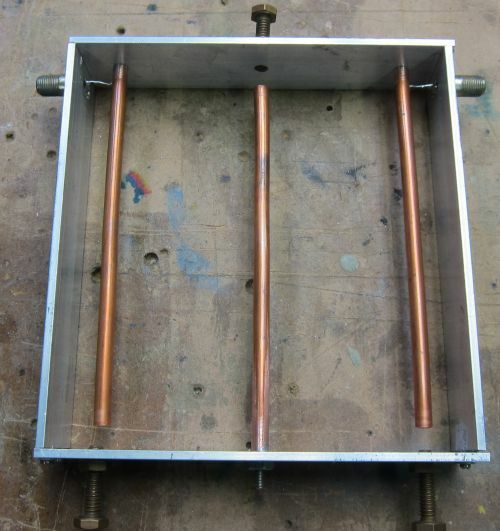 Three rods of 3/8″ soft copper tubing are mounted onto the sides of the filter which are held together with recessed screws since nothing, not even screw heads nor bolts, must protrude into the cavity or detuning will occur. The entire filter is sandwiched between two flat pieces of aluminum. The final version of this filter lacks the bolted brackets on the top and bottom which served to keep the frame square (the frame is simply squared when installed in the top and bottom pieces which, when clamped, hold everything in place). Careful tuning is required for the filter. It was found that the easiest procedure is to adjust the center bolt to optimize the desired signal then tune the outside bolts to eliminate unwanted signals (e.g. set the receiver for RF14 and tune the bolts to eliminate that signal completely then verify RF15 is still there). It is a tedious procedure but once complete the bolts can be tightened and forgotten. Another hint is to reduce the signal massively using splitters as inserted losses in the signal feed (or a -16dB tap as I did) then tune the filter with a weak signal allowing the peak to be determined much easier than with a large signal. This was needed for the COZI filter (described below) which is only 18MHz away from a massively powerful neighboring signal and so especially critical tuning was required. The filter works so well it replaced all other filters from the YAGI rendering them unnecessary. Surprisingly, it eliminated RF14 only 6MHz away! This resulted in a ‘cleaner’ system. An additional variable gain amplifier (up to 20dB) was added immediately before the filter to boost the level of the final RF15 signal level to about the same as all other channels. The amplifier is placed before the filter so that any broadband noise produced will be filtered out from entering the system. The next station to get was WPXJ (ION) on RF-23. This station, located 65 miles away, can only be received as a signal diffracted off two edges … in other words, it is WEAK! An eight element YAGI was constructed for an optimized frequency of 509MHz (allowing reception of both this station and WBXZ on RF17 as well). With a 33dB preamplifier (a Radio Shack 15-259 which features two 75Ω outputs) mounted right on the antenna it was carefully aimed south-west allowing it to receive both RF-17 and RF-23. Both signals are received ‘loud and clear’! And now the main problem: separating the two desired signals from the multitude received so that they may be mixed into the system. Having an extremely high gain amplifier, the YAGI receives many of the Buffalo signals already received by the G-H, although fortunately it does not appear to receive any Toronto signals from the north. It was originally hoped that a narrow bandpass filter could be built to pass RF23 and exclude other signals. The problem is, of course, dB’s … while a filter can be built to pass RF23 and exclude surrounding signals some of those signals are immensely strong compared to others and so still appear at levels where the cause destructive interference. Consider channel 4 (RF39). TV Fool will show that the signal strength of that channel is 40dB stronger than that of the desired channel: this is 10,000 TIMES stronger !!! Assuming that we need to decrease the signal on RF39 to 10dB below that of RF23 (so that it will not interfere with desired channels), I am not sure if I can even construct a bandpass filter that has that steep a slope (over 100dB/octave) and even that is not remotely enough to discriminate between two very close channels such as RF17 and RF15 which will be required. This was clearly a job for yet another interdigital filter. A second three-element interdigital filter was constructed specifically for RF-23 (524MHz to 530MHz). The filter design was specified with a center frequency of 527MHz and a bandwidth of 10MHz. The filter is indeed selective enough, when tuned properly, to pass RF23 and eliminate anything below RF20. When not properly tuned, it was found to exhibit a larger bandwidth which passed both RF17 and RF23 which might be desired since it would allow reception of both signals however it would certainly interfere with nearby signals at RF15, 19, or 20 so the filter was tuned properly to optimize for RF23 only. It passes some signal at RF26 (which is very strong) but completely attenuates anything above RF30. In addition to RF23, RF17 WBXZ (RF channel 17, virtual 56) a low-power Buffalo station which carries several retro TV networks is also received by the same antenna. Like RF23, it is a marginal signal, this one aimed at the Buffalo market. This signal is available via a second output from the amplifier on the ION YAGI and is separated from the same antenna by a third interdigital filter. Unfortunately, the antenna pulls-in the already strong signal at RF14, so strong that enough passes through the interdigital filter to cause interference problems when combined with the other antennas – another situation where dB’s trump all else. Unlike the other antennas like the RF15 YAGI, this one “pins the needle” with an extremely strong signal on RF14 since it is aimed towards Buffalo and 33dB is a LOT of amplification. The addition of an LC notch (bandstop) filter in series with the interdigital filter solved that problem, improving the cut-off of the filter below RF17. These two filters now allow reception of RF17 with no effect observed on any adjacent channel including RF15 and RF19. The RF17 and RF23 signals, now separated via high-performance filters, are recombined with a splitter. WBXZ had some issues in 2017 then went off the air but has finally reappeared. A second amplifier was added before the interdigital filter to boost the weak signal again which helps reception immensely (sure, the amplifier likely adds noise but it is filtered out at all frequencies except RF17 by the interdigital filter). The complete three-antenna system, no longer in use. The complete four-antenna system. Note how the use of extremely selective interdigital filters eliminates many small L-C filters simplifying the system. Note, also, that the signals are amplifier prior to selection by the interdigital filters so that noise from the amplifier is filtered-out as well. To the right, the main G-H antenna with NARODs and reflectors is seen at the top of the mast and the high-VHF channel 9 YAGI mounted under it. 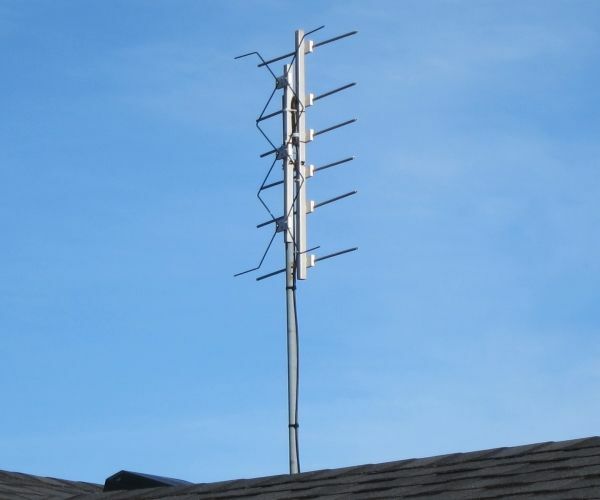 The slightly different antenna orientations were due to the fact that alignment was done experimentally to optimize each direction: the G-H was oriented for the weakest Toronto signals and the YAGI oriented for optimal channel 9 reception. The complete system starts with the roof-mounted GH-6 antenna onto which a 300Ω to 75Ω balun (matching transformer) is directly mounted immediately followed by a 10dB inline amplifier (screwed directly onto the balun). This amplifier receives power through the coax with the power injector mounted on the end of the fifty-foot RG-6 line in the basement. The GH-6 feed line has a very high-Q parallel notch filter installed and tuned to eliminate RF channel 15 (although, as noted, tuning is quite critical). The G-H signal is then combined with the RF-15 signal from the low-UHF YAGI. The low-UHF (channel 15) YAGI has a balun and 10dB mast-mounted amplifier which sends signals through sixty-two feet of cable to the basement. The signal from this YAGI is then amplified another 20dB then filteres via a three-element interdigital filter which acts as a bandpass for RF15 only. The interdigital filter eliminates the need for any other filters (including, previously, a channel 14 notch filter tuned to a slightly lower frequency to avoid causing too much attenuation of the desired channel 15, a bandpass filter as described, and a simple quarter-wave coaxial stub notch filter tuned to eliminate channel 39). 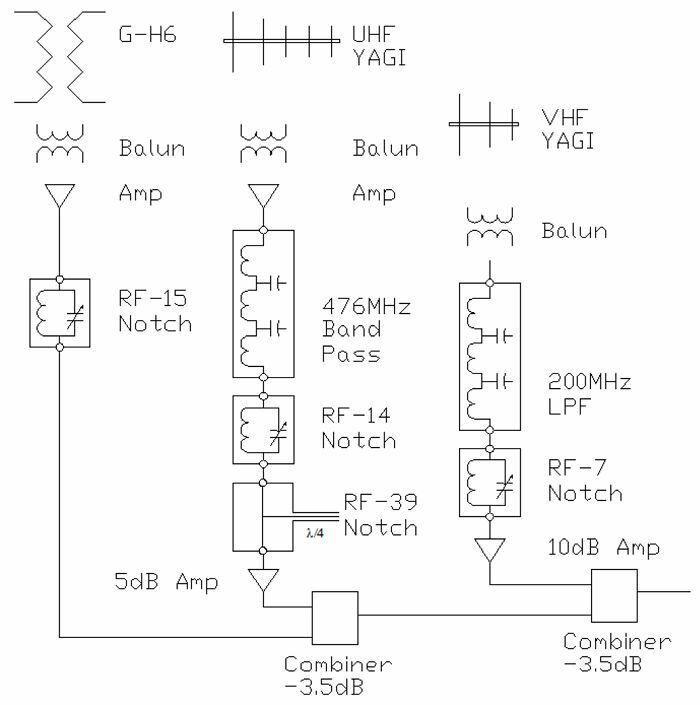 The high-VHF YAGI signal (from the three-element YAGI mounted directly below the G-H) is low-pass filtered to eliminate all UHF signals and notched for RF-7 (which is picked-up by the G-H antenna) … this effectively makes a bandpass filter for the antenna. The high-VHF YAGI also has a 10dB amplifier (not mast mounted, though) to equalize signal strength. Finally, the signal from the high-gain UHF YAGI used for ION (RF23) is filtered using another interdigital filter. The resulting signals from the four antennas are then combined with three normal splitter/combiner (and encountering a 3.5dB loss times two in the process) and the single coaxial cable fed to a 5 dB distribution amplifier and to multiple TVs (including an over-the-air PVR) in the house from there. Note that all filters are placed after the amplfiers so that broadband noise produced by the amplifiers is filtered-out and does not enter the system. For example, the extreme amplification of the RF15 YAGI results in both a strong signal at RF15 (476MHz to 482MHz) but it also results in a lot of broadband noise at essentially all frequencies which would serve to lower the signal-to-noise ratio on all other frequencies. Placing the filter after the amplifier eliminates this noise. Of course, as discussed above, there is a lot more to it including design and alignment of the antennas to minimize interference between them (e.g. use of a narrow-beam YAGI hidden behind the dwelling to limit reception to desired signals). There are a large number of small networks which are unique and not available over Canadian cable in this mix as well, such as Antenna TV (2-2), My TV (49-1), Me TV (67-1 and 67-3), This TV (67-2), get TV (49-2), and the ION network (51-1). Many play old series from the 60’s, 70’s, 80’s, and 90’s. At this point, the antenna system covers all major networks and channels including many networks not available on Canadian satellite or cable. Essentially every other channel available in my area is a network duplicate of a channel I already receive or is a duplicate repeater for an existing channel (for example, Erie, PA has stations available which are on NBC, CBS, ABC, and PBS networks – already available from Buffalo). Forty-eight channels is about the most available in this area. Consult TV Fool for your area and determine which stations you CAN get as well as which stations you WANT to get. Based on radiation patterns for various antennae, choose one that brings in the majority of the desired signals. A YAGI, for example, has a very unidirectional pattern which is best for receiving signals from one direction only while a G-H antenna, like my primary one here, has a high gain in the forward direction plus, depending on the exact design, two side lobes and a back lobe. This one antenna, properly designed, might even suffice so try it first. Depending on your primary antenna, you might be missing channels in the VHF band (for example, my primary antenna did not receive channel 9 which was desired). If so, a simple antenna (like a three-element YAGI) or a higher-gain antenna as required can be used. 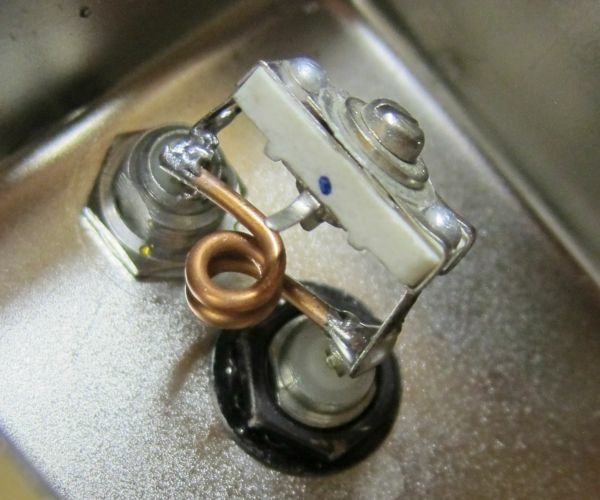 Build one and ensure this antenna, on its own, pulls-in those signals (connect it directly to the TV). If this works, build a filter so that only VHF signals pass from the VHF antenna. The VHF antenna will, undoubtedly, receive UHF signals as well and these will destructivley interfere with thise from the primary antenna. A basic low-pass filter designed for 200MHz will work here since the bands are far (at least one octave) apart. A seven-element Butterworth L-C filter will attenuate UHF signals by at least -40dB which is more than sufficient for most setups. If necessary, build a filter to exclude signals from the main antenna. In my case, this was deemed unnecessary since the VHF signal did not change when the main antenna was removed however if there is an appreciable difference with and without both antennas connected a UHF high-pass filter would be needed on the G-H (I might add that when I boosted the G-H signal another 10dB, the VHF signal _is_ affected quite a bit so this is a bit of a balancing act … the safest thing to do is build the filters: one high-pass on the main G-H and one low-pass on the VHF). If you are missing weak channels on the same UHF band, consider adding a high-gain YAGI to pull those in. In my case the desired channel 11 (RF-15) had this problem. Build an antenna specific to that channel (in my case, a high-gain YAGI with six elements) and again, test it on its own to ensure it receives the desired channel properly. If the high-gain antenna works to pull-in the desired signal, you (a) MUST filter that antenna to pass ONLY the desired channel and (b) often might have to trap the main antenna to notch the signal using a series L-C trap. When designing a flter for the new high-gain antenna consider how close adjacent channels are to the desired channel. If very close, a very narrow band filter (e.g. an interdigital filter) might be required, otherwise a simple L-C filter might work but be aware of the slope of a n L-C filter. If the nearest adjacent channel is close, a ridiculous slope might be required (e.g. over 60dB/octave) which cannot be achieved practically in which case go right for the interdigital design. To determine if a trap is needed on the primary antenna feed combine the signals from the new antenna, filtered for the one desired channel, with the primary feed. If the signal strength of the channel decreases with the primary antenna added, a trap is required. A series L-C circuit will work but if it is adjacent to a desired channel, a high-Q filter using flat windings is recommended. Antennas may be added as desired for additional weak channels (for example, in my case, channel 51). Once again, the antenna will require filters so that only the desired channel is passed to the system. Notching of the signal from the primary feed is likely not required for a weak signal since that antenna will not receive it to any appreciable degree. Amplifiers may be added as required to boost signals and equalize strengths. Be sure amplifiers are placed BEFORE filters to ensure broadband noise produced by the amplifier does not enter the system (the filter will remove this noise at frequencies other than the desired channel). On my system, this was done with channel 56 when their signal was found to be reduced in amplitude post-2017.